Mylor Sailability received £1,500 from the business club of the CCF towards a Hawk 20 keelboat for people with disabilities. Sailing freely at beautiful Carrick Roads is an uplifting and brilliant escape from the frustrations that disabled people can face on land. Cornwall 100 Club members Jonathan Cunliffe from Savills and Roger Graffy from Mylor Yacht Harbour visited the project. Mylor Sailability is a charity founded by Tracey Boyne and provides sailing and powerboat training for those with a physical or mental disability. 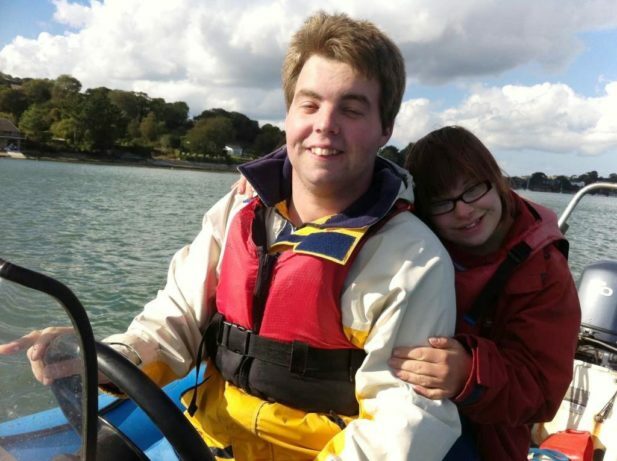 Mylor Sailability is the only coastal venue in Cornwall that provides sailing and power boating sessions to people with disabilities. Over 110 booked into their first taster session in Oct 2013 and since spring 2014 participation figures have grown from 20 to 50 people per week. There are currently 6 sessions per week including a couple of separate sessions for the over 50s. There is a demand for more sessions but funding is preventing this from developing. In November 2015 Mylor Sailability won the Sportivate Project of the Year Award. The group is working with Jonathan Stevenson who is involved with training with the Paralympic Team GB to highlight any gifted and talented students. Mylor Sailability will purchase a used Hawk 20 that can come alongside their pontoon at any tide as it has a lifting plate for a keel. The group currently do not have a large boat that can do this and are therefore dependent on the tides for keelboat sailing. This boat, the Hawk 20 is very versatile and can sail for recreational fun or race competitively. They will also be adapting the boat to take a support chair for those people who cannot sit unaided. The Cornwall 100 Club, the business arm of the CCF awarded a total of £22,206 to fourteen community projects in March. A second round of funding will be available later this year. Since its inception over 8 years ago, it has invested over £200,000 into communities in Cornwall and the Isles of Scilly, supporting over 100 local projects.